Registration for the 2019 CMR is now closed. ​The registration fee includes conference materials, continental breakfasts, Saturday lunch, and refreshment breaks. While registration is open throughout the conference, we encourage early registration to enable us to provide the best possible service to participants. 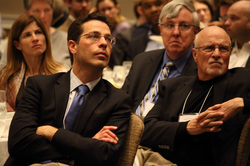 Participants at the 2015 Conference. *A student is defined as one who is actively pursuing an undergraduate or graduate degree and has not received a doctoral-level degree (e.g., MD, PhD, JD, or equivalent degree).